Most of the time when people think about paragliding in Punta Cana they really mean Parasailing (see our Parasailing section). There are some powered paragliders around but this – compared with Parasailing – is far from popular. Dominican Republic has four main mountain ranges: Cordillera Oriental, Cordillera Septentrional, Cordillera Central and Sierra de Baoruco. Some of the peaks are over 3000 meters (almost 10 000 feet). The closest spot to Punta Cana is Miches. 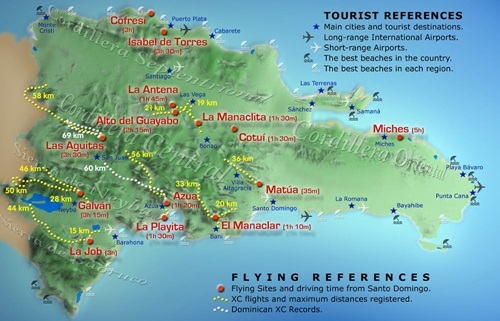 There are number of good paragliding spots around the Dominican Republic and here is the map showing them. Caribbean Flying is a fantastic resource about Paragliding in the Dominican Republic.